How Do You Add Matrices? 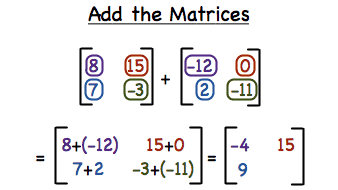 Adding matrices is easier than you might think! Just find the corresponding positions in each matrix and add the elements in them! This tutorial can show you the entire process step-by-step. How Do You Add a Negative Number to a Positive Number? How do you combine a positive and a negative number? This tutorial shows you how. You even get to see it explained with a number line! How Do You Subtract Matrices? To subtract matrices, you need to make sure that the matrices have the same dimensions. If they do, match up the corresponding positions in each matrix and subtract away! This tutorial takes you through the steps of subtracting matrices.